"I loved Yamaha drums as a student which lead me to my first Recording Custom. As a performer and teacher I now love the sound, construction, reliability and statue that comes with the Yamaha brand. I love my Yamaha drums so much I bought a Yamaha Jet Ski too!!!!" Matt Cocking is a successful performer, entertainer and educator who remains in demand across the nation and is dedicated to inspiring a smile and fostering confidence through innovative performance. Matt has an extensive background in peformance, teaching and large events. His love for Marching Band and Drum corps began in 1993 as a member of the Madison Scouts Drum Corps, Madison Wisconsin. While competing in Drum Corps International (DCI) a greater passion for perfection was born. From these grounding days Matt has now worked as a performing musician, adjudicator, educator, mentor and held management roles in the arts. 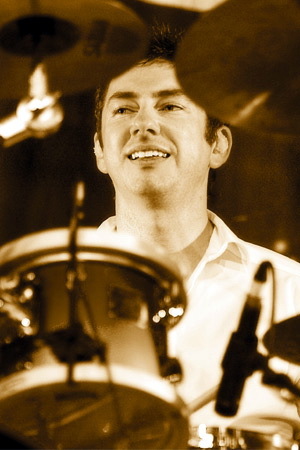 As a performer he has played professionally both nationally and internationally with the Queensland Orchestra, Warner Bros Move World band, Odyssey, Bang! and has backed many national artists. As an educator Matt is a national and international clinician instructing at Sheldon College, Redlands College, Redeemer Lutheran College and directing the John Paul College Marching Band. Matt is also Managing Director of Creative Kidz on Stage, a company designed to place music programs in schools. His charisma, passion for excellence and fun has also lead Matt to being an integral member of the artistic teams for large events such as the 2000 Olympic Opening Ceremony, 2001 World University Games Opening Ceremony Beijing, and the 2003 World Cup Rugby Opening Ceremony. He is also currently on the artistic team for the 2008 Beijing Olympic Orchestra.